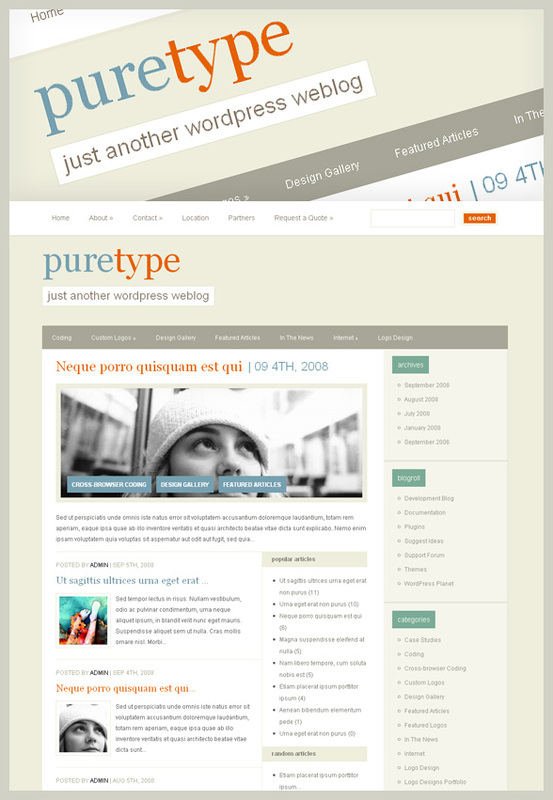 I have finished a new theme today entitled PureType. You can check out the live demo and the gallery page for more details. My goal with this theme was to create a simple and elegant design using no images (unfortunately I did end up using a single image, but it is just a 1pixel high single color .gif, so I think the spirit of the design is still intact!) 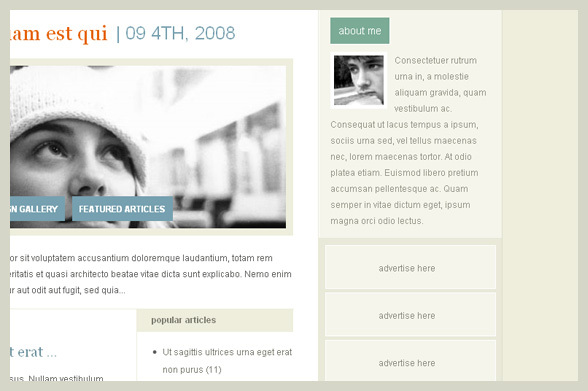 The result is a strong type-based layout great for personal blogs. I focused on creating a more “elegant” color relationship similar to some of my earlier designs (and the ElegantThemes design itself). I also, however, including a few alternate color schemes for those looking for something a bit more bold. PureType comes with three different color schemes. If the default skin is a bit too light for your liking you can try out the Black or Blue variants. You can change your blog’s color scheme at any time from within the Theme Options Page at the click of a button. 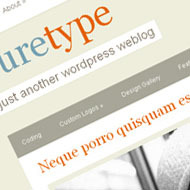 Similar to ColdStone, PureType comes with three widget ready areas. 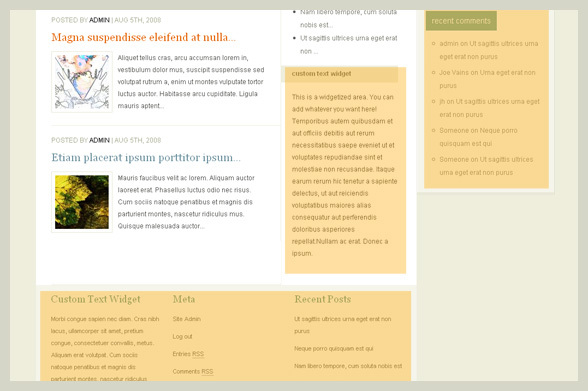 The default sidebar is widgetized, as well as the footer and the homepage right column. This should make customizing your blog much easier. 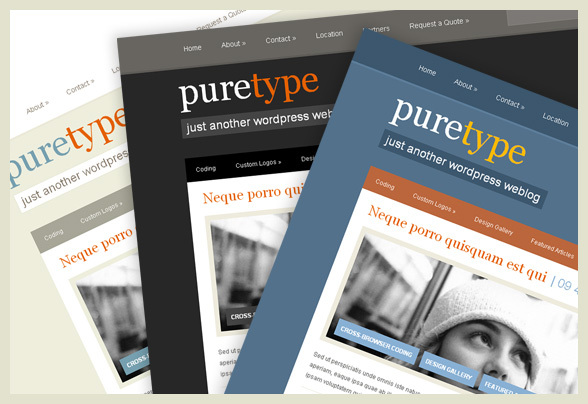 PureType comes with all the bells and whistles that are usually included with my themes. There is an About Me section that can be added to the sidebar, as well as an easy-to-use banner management system for 468×60 and 234×60 ads. Furthermore I have done my best to make each element of the theme optional. If you don’t want to use thumbnails that is fine, if you don’t want to display featured/random/popular articles just turn them off. The About Me section and all banner ads can be removed and you can also opt for a more traditional Blog-Style-Layout if the default structure does not suite you. I hope you find this new addition useful. As always, stay tuned for more designs! but its still looking much the same layout design as your previous themes. I am still looking a clasic 3 column (right and left column) with latest java and a clean design. Very nice and cool theme! Excellent, appropriately selected styles, colours, everything on one’s place, realy great. However remember dear author, that quality is what user needs, not the number of designs. You know those commments reply buttons you have on most of your themes? Why is the text off center so much? I think it kind of ruins them (I’m horribly obsessed with symmetry). Nice work. Do you use any plugin to those drop down menus, or its just CSS coded? Hi, the theme is very nice, but when I download and decompress, the image folder come with images of the studioblue theme. Oops, good point, I have deleting the unneeded images from the ZIP. Thanks! Just wondering, is it possible to switch the sidebar to the left with this theme? There is no automated option to do this, you would have to edit the theme files to accomplish such a change. It’s certainly possible though. That is a really awesome wordpress theme! it is really interesting…keep it up….look forward to read more from you. wow, what a great job customizing it! I chose this theme also but I am having MAJOR problems with it…it’s not up live–but wondering if your installation was easy from the get go? If you require assistance please use the support forum and we will help you out. headlines on frontpage – i would like to get two-line headlines instead current end cutting and three dots replacing. With three-column theme, there isn’t too much width for content column anyway, most headlines are too long for one line. I plan on releasing a new theme before I resume making major theme updates. this is really great. but please tell me, is it tag-friendly? i really need tag cloud so I need to know if this theme supports it. PureType is certainly one of the best themes of all. The other colors in the theme is really a good deal. Nick, are we going to see a magazine style theme soon, from Elegant Themes? …. hint, hint, Hiiiiiiiiiinnnt …. Social Media Theme ! fantastic theme.. very neat design and great color combination..i love it.. Elegant Themes on standstill ? Any news on updates, new themes, rumors, dirty stories … anything ? Nick, are you still alive ? Im with you bro, he hasnt been around here in a while, nor new posts. I am still alive, it’s called college finals! I just finished yesterday after a crazy couple weeks. I am taking a few days to answer emails/forum inquiries, then it is back to work on new themes. Don’t worry, I am still here and working very hard, but there is only so much time in each day 🙂 Expect a new theme release in less then a week! Sweet 🙂 Good stuff Nick. Hello! I am a web designer. Can I design a wordpress theme for sale it on this page? (like a collab). I am using it already on my blog, Very nice job! I am using the theme and like it very much. I am having a problem getting the featured article to show up. I read the directions and created a Featured Articles category and the added a pst in there. I made sure it was set to “display” in the options and it didn’t work. Am I missing something? Please use the support forum for help. Make a post and include your URL and I am sure I can fix the problem. The first thing you should do is delete the category slug to return it to default (featured-articles), and make sure that you have spelled “Featured Articles” correctly. Professional work, all themes are great. Great theme – I’ve added it to my collection at http://www.bestwpthemes.com. Keep up the great work! wow this theme looks great! I love it! I’m a member using PureType on a site for a client. The Home page widgets are not showing up. Instead the regular sidebar widgets are showing in the home page sidebar. When I go to the home page http://www.joewayneart.com/home.php I get a file not found error, but the file is there. I’ve never seen this with any theme that has a home.php. Can you tell me what’s up? I’m using the blogstyle, by the way. In the future please direct all support questions to the support forum, I prefer not to give tech support via blog comments. Very fine theme, by the way. It really is attractive. Hi Nick, just popped in to say that I love your themes, I am changing all my sites over to them soon. I have launched a website using PureType, called My Green Nappy – an advocacy site for modern cloth nappies in Australia and New Zealand. I’m getting great comments about the site! Is there a way to setup the post thumbnail image link to link to the image? I have located the section of code in the thumbnail.php file, however am not as familiar with calling image URLs, or the specific way you may be going about implementing it. Yesterday i joined elegant themes as a member when i sign into the members page internet explorer says it has a problem and needs to close it is only on this site ,and when i am in the members are . Is this my computer ??? I’m really liking this site to use on my blog. I’d like to add and Aweber opt-in for my newsletter that i’m creating. Does PureTYpe supports this?? Having trouble having a logo appear in the upper left. Have followed all the instructions. Whats wrong?? If you are experiencing problems, please open a thread in our support forums so that we can assist you. I am unable to upload my logo. It is in PNG format. I have added it to my media library and through the epanel, I added it as my logo, but it is not showing up. I tried going through the editor to make the change, but couldn’t figure it out. Please help. i am trying to use theme, but its showing up plain content,the other themes are working fine, but its not working. what is the reason ??? I am finding it difficult to shift the Sidebar position from Right to Left. Can some assist please?